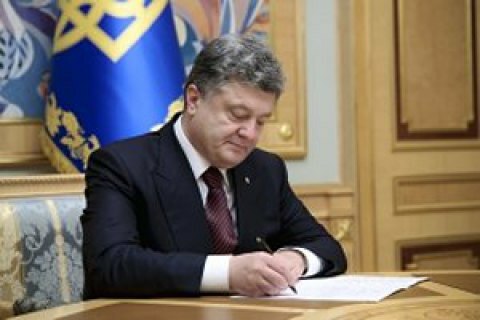 Ukrainian President Petro Poroshenko has signed a decree, which enacts the National Security and Defence Council's (NSDC) decision dated 16 September 2016 on application of personal special economic and other restrictive measures (sanctions). The document is published on the president's website, according to UNIAN. The press service recalls that the NSDC at its meeting on 16 September 2016 extended sanctions against all individuals (except persons who have died) and legal entities, which have been introduced since16 September 2015. It is reported that the NSDC has also decided to expand the list of persons subject to personal restrictive measures (sanctions). The list was expanded by 335 individuals and 167 legal entities whose identity data had undergone additional check. Further, the president instructed to draw up a decision concerning restrictive measures (sanctions) against the persons who were involved in carrying out the election of deputies of Russian Federation's State Duma in the territory of the annexed Crimea. The sanctions would be applied both against "deputies" and members of the "election commissions." The decision about the list of persons subject to sanctions will be made public in the near future, according to the press service.